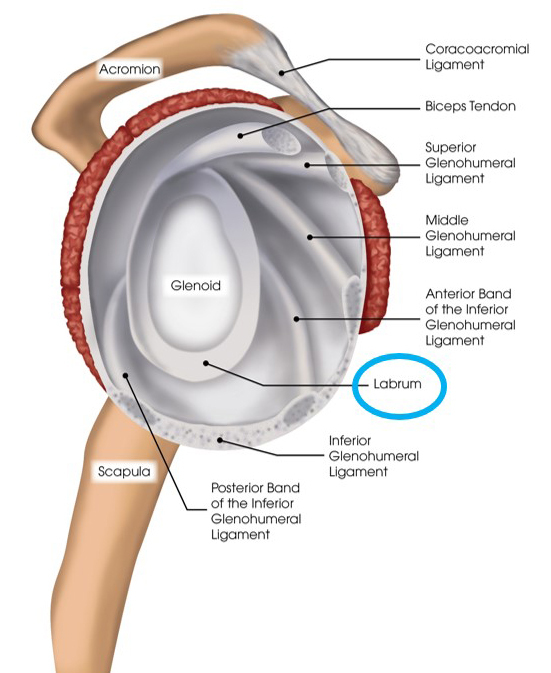 As we mentioned, in order to make the shoulder socket a deeper cup to receive the ball joint of the humerus, the outer rim of the cup is ringed by a tough flexible tissue called a labrum and this makes the shoulder much more congruous (joins together better). 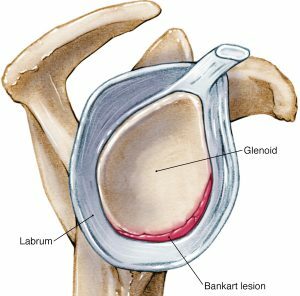 The two most common types of labral injuries are SLAP (Superior Labrum from Anterior to Posterior) tears and Bankart tears. 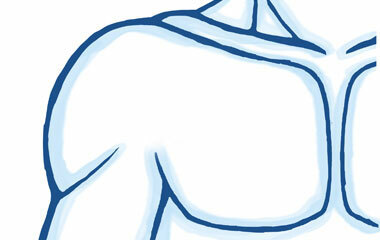 SLAP tears occur at the front of the upper arm where the biceps tendon connects to the shoulder. 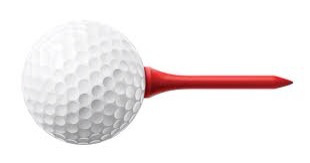 Athletes most prone to this injury include people who are involved in ball sports such as tennis or volleyball players who engage in high-energy, quick-snap motions over the top of the shoulder. 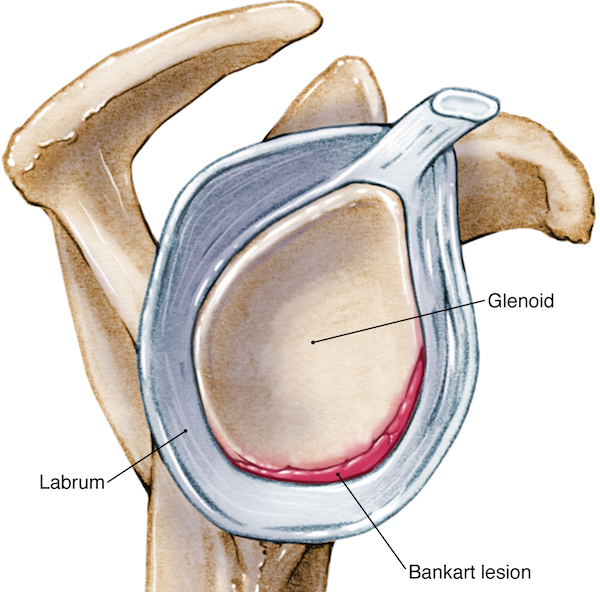 Bankart tears, on the other hand, typically occur with shoulder dislocation in younger patients when the head of the upper arm bone (or humerus) either shifts toward the front of the body tearing the labrum in the process. 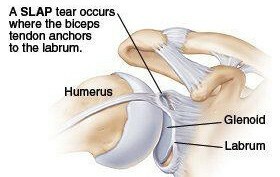 Both types of tears are usually accompanied by aching pain and difficulty performing normal shoulder movements. With Bankart tears, patients may feel apprehension that the shoulder may slip out of place or dislocate in certain positions. Patients with SLAP tears may experience pain at the front of the shoulder near the biceps tendon. 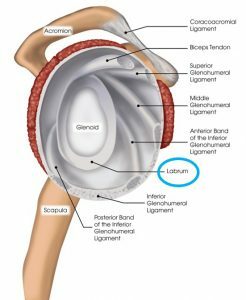 Unfortunately, labral tears are hard to prevent, especially in athletes, because the force of the overhead motion contributes to the injury. Although athletes are most prone to labral tears, people who experience a traumatic event – such as falling down a flight of stairs – are also at risk, particularly older adults whose cartilage becomes more brittle with age. Bursae are structures that occur throughout the body and they are basically little sacks of fluid that typically occur between bony surfaces and overlying soft tissue (such as a tendon) and there are roughly 160 in the body in total. They essentially act as little cushions that help to prevent the effect of friction. The main bursa in the shoulder sits between the rotator cuff (muscles that stabilize the shoulder) and the acromium (a bony hook above the top of the arm that curves around from the shoulder blade and joins the collar bone). 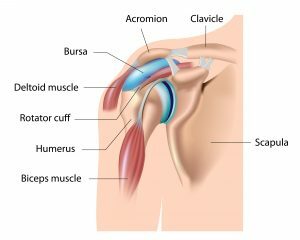 This allows the rotator cuff tendons to glide smoothly beneath the acromium (hence it is termed the sub-acromial bursa). When you raise your arm, the bursa is compressed and when you lower your arm it returns to its normal size. Your sub-acromial bursa is the most commonly inflamed of the shoulder bursa because of its duty in helping protect the rotator cuff. Bursitis around the shoulder can be caused by a repeated minor trauma such as overuse of the shoulder joint and muscles or a single more significant trauma such as a fall. 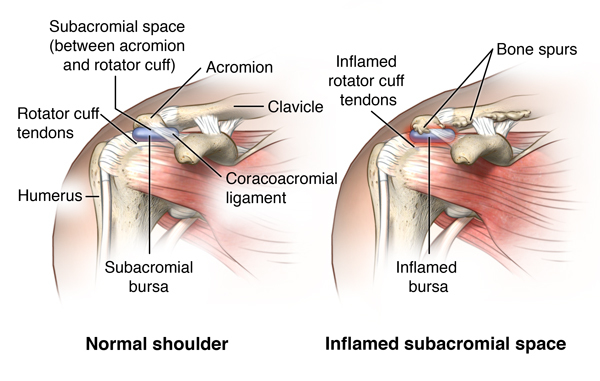 It is also usually associated with other shoulder conditions such as rotator cuff tendinopathy and impingement syndrome (when bony spurs can aggravate a bursa as in the diagram below). ▪Gradual onset of your shoulder symptoms over weeks or months. ▪Pain on the outside of your shoulder. ▪Pain may spread down your arm towards the elbow or wrist. ▪Pain made worse when lying on your affected shoulder. ▪Pain made worse when using your arm above your head. ▪Painful arc of movement – shoulder pain felt between 60 – 90° of the arm moving up and outwards. ▪When your arm is by your side there is minimal pain and above 90° relief of pain. ▪Shoulder pain with activities such as washing hair, reaching up to a high shelf in the cupboard. Thoracic outlet syndrome (TOS) is when blood vessels or nerves in the space between your collarbone and your first rib (this is called the thoracic outlet) become squashed. This anatomical space can be seen in the diagram below. TOS can cause pain in your shoulders, arm and neck and numbness in your fingers. This can happen for a variety of difference reasons such as a traumatic onset (from a road traffic accident) or it can be sports related or occupational or even just because of variations in your specific anatomy (some people have an extra rib). The good news is that in most cases this condition usually responds well to manual therapy. TOS affects approximately 8% of the population and is 3-4 times as frequent in woman as in men between the age of 20 and 50 years. Females have less-developed muscles, a greater tendency for drooping shoulders owing to additional chest tissue. They also have a narrow thoracic outlet and an anatomical lower sternum which all contrives to make them more susceptible. The mean age of people effected with TOS is 30s-40s; it is rarely seen in children. 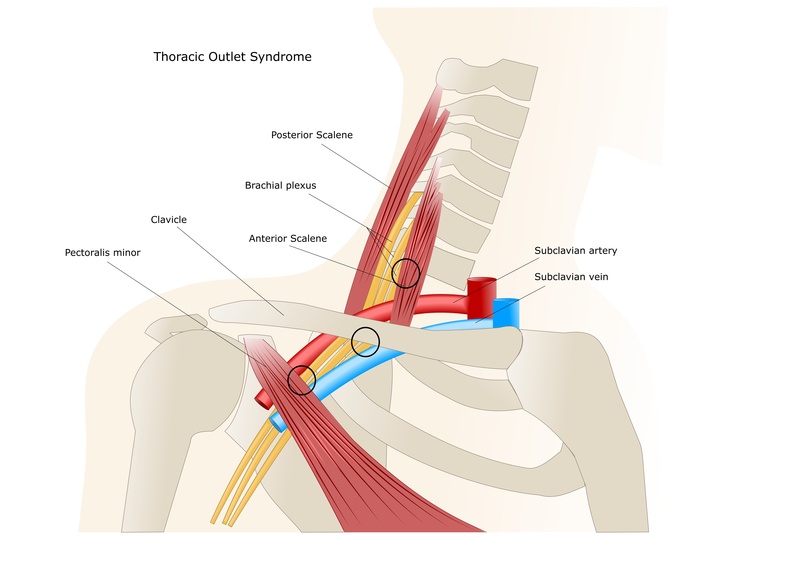 Almost all cases of TOS (95-98%) affect the nerves from the neck (or brachial plexus); the other 2-5% affecting vascular structures, such as the subclavian artery and vein. Obviously the symptoms differ quite significantly between each person because this depends which nerves or major blood vessels are being pressed on and how much.Generally people present with pain anywhere between the neck, face and back of their neck or into the chest, shoulder and upper arm and this can also be allied with pins and needles. People can also complain of altered or absent sensation, weakness, fatigue, a feeling of heaviness in the arm and hand. The skin can also be blotchy and cold. The main reasons for TOS is often because of tight muscles in the neck (called scalenes) or chest (pectoralis minor) or the position of collar bone (clavicle) or first rib. Signs and symptoms are typically worse when the arm is raised to the side and rotated outwards with your head rotated to the same or the opposite side. As a result activities such as overhead throwing, serving a tennis ball, painting a ceiling, driving, or typing may exacerbate symptoms.